I love knitting with double-pointed needles. They’re so compact, so efficient, so perfect for socks. I like to use them for hats, mitts, and sleeves, too. 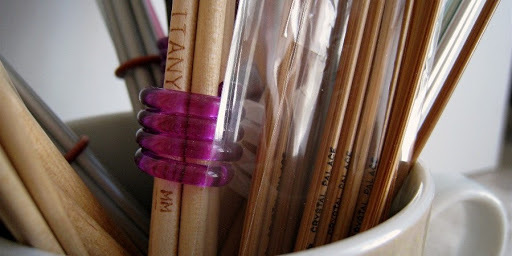 Though I know how to knit small things in the round on one long or two circular needles, I would rather use my beautiful DPN’s. I love the way they feel in my hands. Some of my DPN’s have developed a sweet curve over time, a slight bend that seems to fit me. 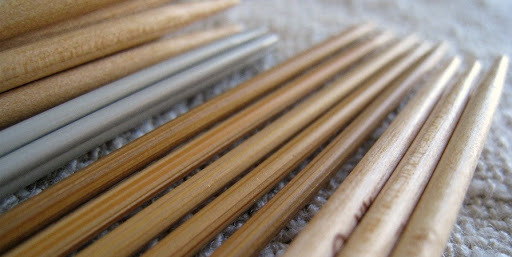 I have metal, plastic, bamboo, rosewood, and birch DPN’s, but my favorites are Crystal Palace bamboo and Brittany birch. Working with DPN’s is one of my favorite things about knitting, especially when I’m knitting socks. 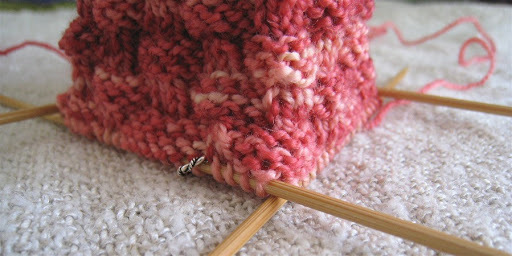 I like to use five needles, and I love the little collapsible square that forms. It’s so symmetrical and precise, and it’s as if I’m building a little dwelling as I knit around. With practice I’ve learned how not to make ladders, or drop a needle, or lose stitches off the end. My DPN’s and I are in sync. Whenever I am in a yarn store, I look for my favorite sizes of DPN’s. I can never have too many! Delightful, Jane! I do love DPNs too! Oh, I am like that about addi turbo’s in small sizes; 1, 2, and 3’s. I just buy them all the time. I almost have enough. I love having lots of favorite needles. Good “D”! I like knitting with DPNs too. 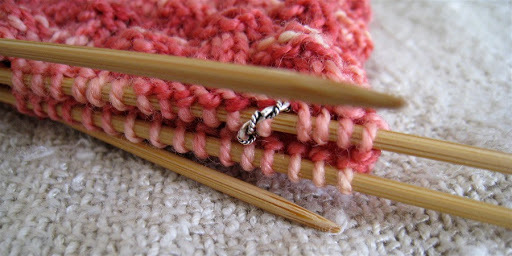 I love bamboo double points and try to knit most projects on them, apart from sweaters of course! Great post! I’m a dpn fan myself. DPNs are the only way to go! I’m actually becoming more and more partial to the Knit Picks Harmony dpns, though. I am also fond of CP dpns. I want to try the options set, but thinking about the multi colored dpn on a multi colored sock makes me feel a bit carsick. I will also someday learn magic loop and 2 socks 2 circs just for the learning, but can’t imagine either replacing my need for the dpns.Brava! You know the best thing about socks on DPNs? When you turn the heel and just start working through the foot, you have a temporary Catfish sock puppet to play with. I can’t count the number of kids I’ve used that on.